The ability to merge and split transactions was an unheralded feature of Flowing Pennies 1.0. The merge and split features were enhanced with our 1.1 release, and we smoothed out some rough edges. One of the enhancements in Flowing Pennies 1.1 is that you can have “nested” merged transactions. In other words, a merged transaction may contain other merged transactions. There’s a new number shown in a gray bubble for merged transactions, which shows the total number of all (non-merged) transactions contained within that merged transaction, no matter how many “levels” deep they might be. Accounts in general are not inherently user-friendly. (They’re bank-friendly instead, as described in this article.) Nevertheless, they are a part of family finances in the twenty-first century, and one common account-related task is to be able to track transfers between accounts. Then locate the two separate transactions; you need one transaction for each account, since the reality is that there really is one transaction for each account, which may be cleared and reconciled at different times from the transaction for the other account. After entering the name of the merged transaction and optionally adjusting the date, click the Merge button. You will now see the merged transaction. That’s all there is to it. And remember, you can split out the original transactions any time. An interaccount transfer is the most minor example of how merged transactions can be used, and the concept of merging transactions can be applied much more widely. Flowing Pennies’ merge footer mode is how you merge multiple transactions into one, or split a previously-merged transaction out into its original set of transactions. The merge mode can be useful for everything from interaccount transfers to monthly summaries, even to annual summaries. 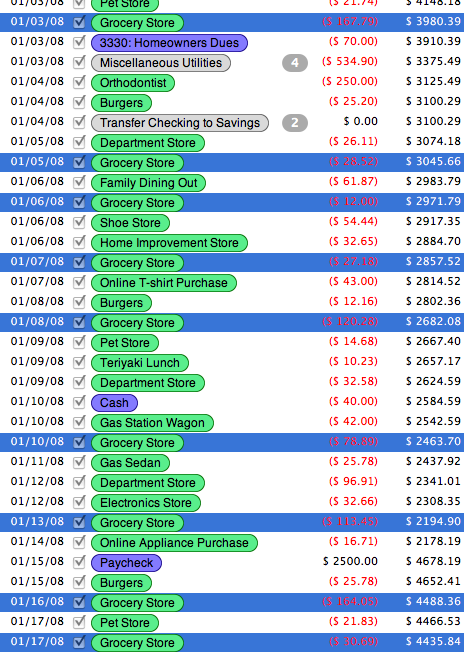 Between these extremes, merged transactions can be used for medium-granularity analysis; I often will merge all grocery store transactions for a month, and call them “January 2008 Grocery Store” for example. Later, after all transactions in a month have been cleared and reconciled, I will merge the whole month into a “January 2008” transaction. Among other advantages, intensive use of the merging feature ensures that months or years (or even, theoretically, decades) worth of transactions can all be held on a page or two. My own Flowing Pennies document contains transactions going back to August 2007 — although Flowing Pennies was not released until March 2008, I was using it for my own finances well before it was ready for public availability — and having monthly merged transactions is a very intuitive and helpful way to see years of finances.